3. Turn right on Olympic Blvd. 3. Exit 10E at Hoover Street. Turn left on Hoover. 4. Continue north on Hoover, bear right on Alvarado. 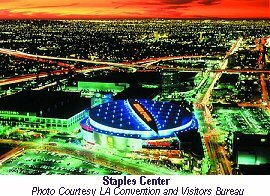 Парковки: The exciting events hosted at STAPLES Center often attract large crowds. STAPLES Center provides ample parking in several lots adjacent to the arena (see the Parking Lot map.) Our Parking Staff will facilitate parking in these lots. It is recommended that you plan your trip before you leave home and allow extra time for unanticipated delays due to traffic congestion, road construction, etc. Always follow traffic safety precautions when traveling to and from events. Parking rates vary depending on the event. Rates generally range between $15 - $20 per space. For further information, please call (213) 742-7275. 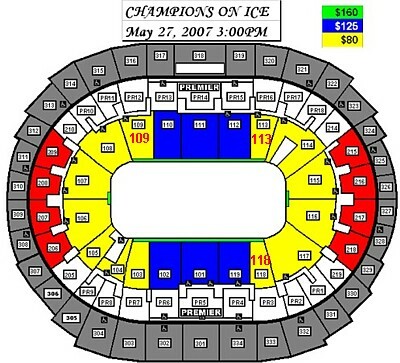 Prepaid parking is available through STAPLES Center's Box Office, Ticketmaster outlets and online at Ticketmaster.com. When you purchase an event ticket, you may also purchase a parking space. Purchasing parking before an event is not only convenient, but it will allow you to plan your trip directly to your designated parking lot and avoid unnecessary delays in locating a parking space. Designated parking is available for Guests with disabilities. These spaces, including van-accessible spaces, are designated for vehicles displaying a current state-issued disability placard or license plate. Guest Services can provide further information regarding parking access for guests with disabilities. Please contact Guest Services at (213) 742-7100. Please observe the No Parking zones located around the arena. Specifically, Chick Hearn Court (formerly 11th Street) between Cherry Street and Figueroa is designated as a No Parking/Tow Away zone. Violators will be ticketed and/or towed. If you wish to purchase tickets at the Box Office or to shop at Team LA, please park in Lot 2. Tailgating is prohibited in any of the STAPLES Center parking lots. Limousines may drop off Guests on Chick Hearn Court (between Georgia and Figueroa). Parking for limousines is available in Lot 3 at a rate of $30.00* for sporting events and $40.00* for concerts. Limousines will not have access to the drop-off area to pick-up their client after an event. Clients should walk across Chick Hearn Court into Lot 3 to meet their limousine. Parking Lot 2 will open at 8 a.m. for Guests visiting the Box Office, FOX Sports Sky Box or Team LA store. Parking Lots 1 and 3 will open two and a half hours prior to the start of an event. All other lots will open 90 minutes prior to the start of an event and will remain staffed 60 minutes after an event. No overnight parking or in and out privileges are permitted. AAA Service is available during STAPLES Center events, including tire service, jump starts, lockout, service and fuel delivery. Services are free, compliments of the Automobile Club of Southern California. На сегодняшний момент событий в этом зале нет.